After ticking over perfectly for a while, the Virage recently started running at 2500 rpm. G checked all the usual relay suspects (see below), but the rpm was still 2500. Checking all the other sensor connections he came to the water temperature sensors. A bit of a wiggle, and the rpm instantly dropped to normal tickover. Yet another oxidised poor connection was to blame. 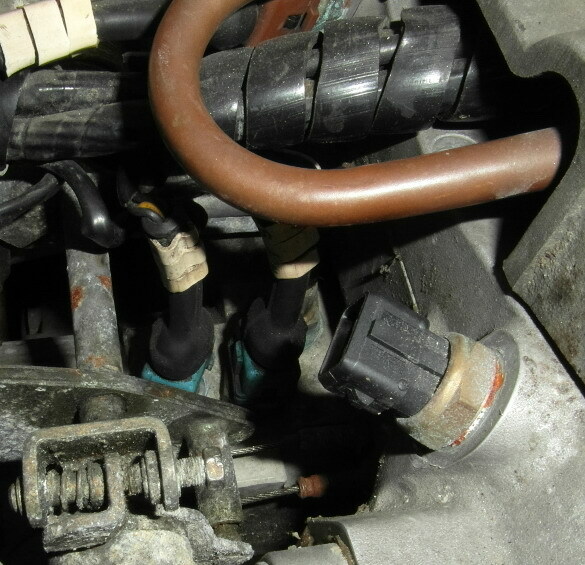 The water temperature sensors (blue) are located between the cylinder heads above the thermostat housing, as shown in the picture below. G has found that the same sensors are used on the Land Rover Discovery and Defender, and cost less than £5 each. Guliiame from France, has also found that replacing the Throttle Potentiometer sensor has fixed an over-running problem. The sensor is the red model PF09 from Weber. It is not available new, but it is possible to buy the black PF09 from Cycleworks. It seems to be available on ebay, and is the same model as used for for the Lancia Delta Integrale and Sierra Cosworth YB.